Modern Group, Ltd and Carer Electric Forklift Solutions have announced a dealer agreement which grants Modern exclusive distribution of Carer Electric Forklift Trucks in its Mid-Atlantic sales territory. Carer leads the industry with an impressive stable of rugged fully electric solutions up to 40,000 pounds. Designed to excel in a diverse assortment of demanding applications, Carer Electric Forklift Trucks are perfect solutions for ports, paper mills, lumber yards, foundries, precast concrete plants, and other Modern customers. The electrical components of the Carer trucks provide significant advantages over traditional internal combustion forklift in that application due to its resistance to the effects of dust and loose debris. A signature aspect of Carer is the capability to work with customers to develop application unique trucks for safely handling radioactive material, super high capacity applications, or custom battery configurations. "We’re excited to welcome Modern Group into the Carer family," says Eric Halfnights, Director of Business Development at Carer. "Modern has a reputation for providing innovative equipment solutions, making them the perfect fit to represent Carer." "We see Carer as a new frontier in high capacity materials handling" said Paul Farrell, President and CEO of Modern Group, Ltd. "This line is a powerful addition to our growing forklift sales operation which will bring exciting opportunities to us and our customers." 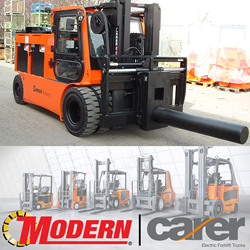 For more information on the Carer Electric Forklift Truck line and set up a demonstration at your facility please contact your Modern Forklift Sales Representative at 800-866-3376 or visit Modern's website for Carer Forklifts.